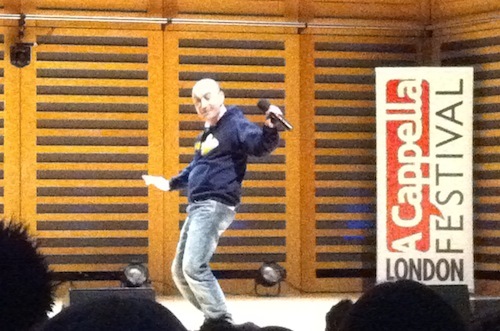 Another amazing night at the London A Cappella Festival. I’m trying hard to avoid these posts just being whole-hearted enthusiasm, but the music is just so good – and let’s face it, there are plenty of professional music critics who can cast a negative light. Let them. I’m having a fantastic time! Tonight’s line-up was Cadence, Canada’s premier all-male a cappella foursome, and FORK, the relative unknown from the not-so distant shores of Finland. Throw in some more Albert Hera and a few great foyer performances from up-and-coming a cappella groups and you have a second night that managed to live up to the superb first. I came to know Cadence through listening to countless episodes of the excellent podcast “Mouth Off” – a short weekly update on all things a cappella, packed with fantastic tunes and fun chat, courtesy of hosts Christopher and Dave. This was the first chance I’d had to experience them live though and they certainly did not disappoint. After a sincere introductory reading of that classic poem “Blame Canada” from Swingle Kevin, the Cadence crew took to the stage, immediately setting the tone for a light-hearted but sleek and schmoooth performance. Their repertoire focuses on lounge jazz and big band type numbers, of which they are masters. I would say the most distinctive aspects of the Cadence sound are their perfectly smooth voice blending and the superb brass section they transform into at the slightest provocation! Brass sounds (think trumpet, trombone, etc.) can be overused in a cappella music and there was no shortage here, but Cadence have it down to a fine art – close your eyes and you can actually believe it’s the real instruments you’re hearing. Case in point: that Cab Calloway classic, Minnie the Moocher (as featured so memorably in the Blues Brothers movie) opens with a brash horn intro which Cadence re-created beautifully near the start of their set. Of course the other thing about Minnie the Moocher is the “Hi-dee-hi-dee-hi-dee-hi” call and response which makes the chorus of the song. The audience tonight were more than happy to oblige! They followed this with “Swing Low, Sweet Chariot”. Like the trumpets, this has a risk of seeming over-done, even cliché for a close harmony group. But again, Cadence pull it off admirably, in this case turning it into a slightly jokey number, and mixing up the rhythm and style often enough to keep things interesting. After a cheesy film noire style Harry Connick Jr song “Forever for now”, they moved onto the one and only ‘serious’ song of the evening: an original arrangement of a Canadian poem by Robert Service, “The Tramps”, which afforded a glimpse (albeit a brief one) of Cadence’s capability for that other kind of vocal harmony; careful, tight, and gentle. I guess it was the Canadian accents, but something in it reminded me of Moxy Fruvous… Wonderful, in any case. 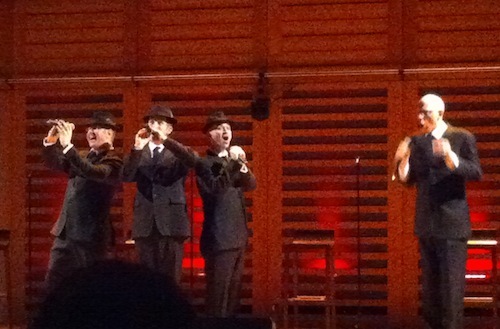 Apart from this short interlude the mood was light throughout, aided by playful banter between songs. The group ended their set with a great medley of songs from the 1910s and 1920s, letting them show off their straight-up barbershop talent to round off the performance. 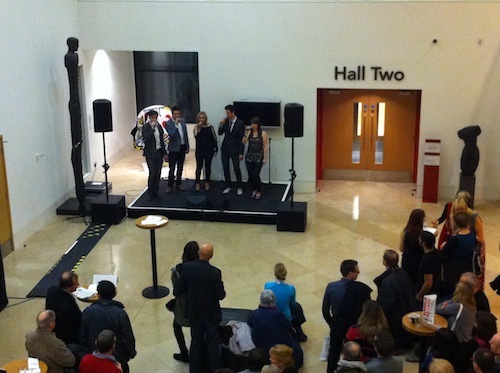 The foyer performances at LACF ensure that there’s always something wonderful to listen to. This evening they were on a small stage in the foyer itself, rather than up on the balcony. Personally I felt this worked less well. The volume was really variable, and there was no way to separate audience who wanted to really listen from those who were chatted and just enjoying it in the background. Still, there were some great young groups performing. The second concert of the evening began with another short Albert Hera skit, who (with a pelvic thrust) got the two halves of the audience singing “Lon” and “Don” back and forth along with his own vocal gymnastics. As with the night before, he brought a joyful energy to the room immediately and kept everyone singing and laughing for the (all too brief) few minutes he was up on stage. FORK were, for me, the big unknown of the festival. I did some brief looking and listening online, but mostly left it as a surprise. Talk of smoke and lasers and rock spectacle did nothing to lower my expectations! In fact, the four from Finland brought a 70s rock star swagger to a cappella music, which isn’t something I would have thought possible. More than anyone else I’ve seen in three years of the LACF they put on a show, from their outfits, to dynamic use of the stage lighting, to talk between songs and the songs themselves, this was clearly more a show than a concert. Apparently their lighting guy had been complaining he couldn’t use their smoke machine! At the outset they announced that for tonight we would treat them as kings and queens. After a song or two bursting with in-your-face energy, the audience were convinced – and sure enough, for the rest of the night they were treated as superstars. Their performances showed a great deal of skill, and the kind of polished showmanship that is more common in pop and arena rock than a cappella. However this was balanced wonderfully by genuinely hilarious chat between songs. Though they mostly played the part of arrogant rock stars (and did so to a T), they let their real characters and emotions show through at times. Their talk between songs was in fact more entertaining than most stand-up comics and did a lot to endear them to the listener. Only a few of the songs of the set list failed to wow the audience, likely because they just weren’t as big hits here as elsewhere in Europe. For the most part though the setlist of pop and rock classics and a few modern numbers really hit the spot. It featured the power rock of “Always on the run” (in fact sung by one of the girls of the group, complete with very non-Slash snappy dancing!) 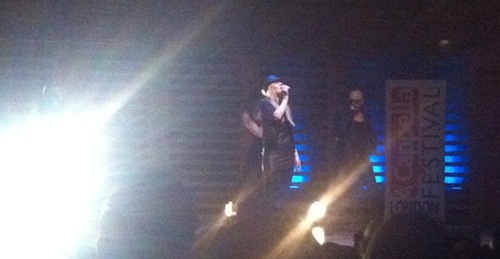 and raunchy “Only girl”, some dance/disco with Madonna’s “Ray of Light” and Pointer Sisters’ “Jump”, a great techno medley based around 2 Unlimited’s “No Limit”, and a couple of quieter numbers like Coldplay’s “Viva la Vida” and “Fix You” which provided soothing gentle interludes and balanced the high energy of the rest of the show well. Not to mention the supercheese of Lionel Richie’s “Hello” (one of a few songs they correctly identified as “songs you hate… but will enjoy when we perform them”) and amazing version of “The Final Countdown” (featuring a bald man head-banging like you’ve never seen before). The group returned as promised to perform two more songs. The first was quite an odd choice: Nightwish’s “Sleeping Sun”, a soft rock ballad which of course tempered the audience’s enthusiasm and energy. Fortunately this was followed by one of the highlights of the set, an excellent arrangement of Queen’s “Bohemian Rhapsody”. Not an easy track to cover well, but the FORK version was terrific, and the audience went nuts for it. An absolutely amazing performance; hugely fun. Like Cadence before them, there was perhaps a risk you would enjoy the show’s humour so much that you failed to be bowled over by the standard of singing. But nobody could question the musical skill or showmanship on display, and the arrangements in both cases were terrific. 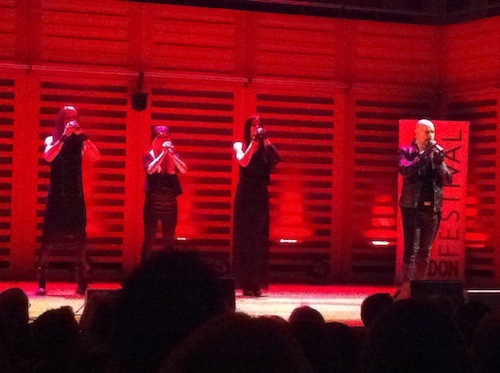 Another superb night of music at the London A Cappella Festival. And to spend a large part of the evening laughing uproariously was an unexpected bonus!